We have carefully sketched a makeshift map. The road continues, it takes us through scrubs and ruts. True wilderness. In the midst of the monotony of the terrain we suddenly see three animals with black and white stripes. They stand and look up but when I try to come a little closer, they get scared and run away. At the same time I ride into some thorns and get four punctures in my front tire. When we stop to fix the punctures, there are several giraffes. We feel like on a safari except that we are just cycling along the ordinary Kenyan road, somewhere between tiny villages, where children are on their way back from school. We ride down a steep slope and on the way we meet another giraffes, zebras, antelopes, their whole families or even herds. We can see buffaloes from a few meter’s distance, but then a local motorcyclist tells us to stop contemplating and quickly get away from there, this is too dangerous, he says. At the end of the downhill part we see a jeep and a driver trying to replace a punctured tire. A few minutes later the car catches up with us. It is Juliet and Nicolas, together with their two kids named Alas and Issac. It is a great coincidence. Cycling inside Masai Mara is not allowed, so our potentially big problem of renting a 4×4 vehicle to enter the reserve disappears. The French-Canadian marriage invites us to hop on their vehicle. All we need to pay is “only” the US$80 each for the national park entrance fee. However, if anyone traveling in Kenya is considering bypassing Masai Mara, it is necessary to get this insane idea out of your head. Our off-road Nissan drives just a several hundred meters from the site, where a few minutes ago we were traveling on bicycles. Looking through the window I see a few agile predators quickly moving among savanna. One of the female lions is about to finish eating entrails of a recently hunted zebra. She has a red mouth and keeps on chewing, biting and swallowing a mouthful of meat. Masai Mara is a most populated with animals nature reserve in Kenya. The area of 1510km^2 is a natural habitat for representatives of the Big Five, also crocodiles, hippos, antelopes, impalas, zebras, cheetahs, giraffes and incredible number of birds. Each of the species is very peculiar. Impalas are very fearful, whenever they sense danger, the whole herd would start to run in the most unpredictable way to confuse the enemy. 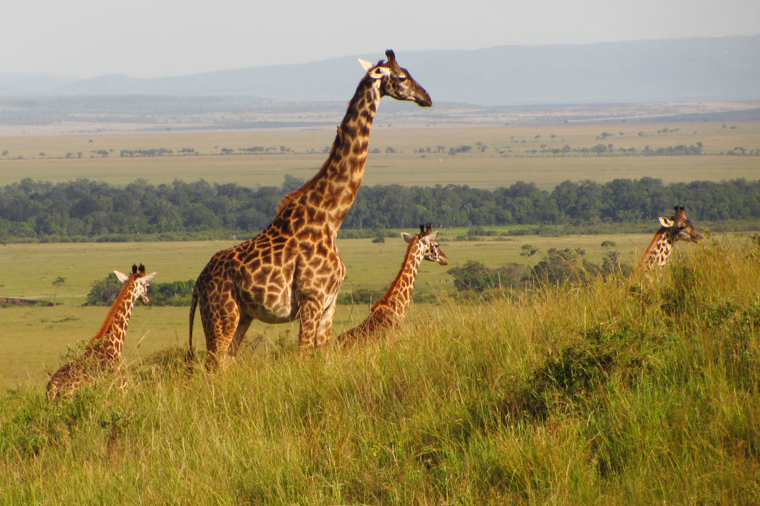 The giraffe is the tallest land mammal. She is full of elegance and dignified movements. When she feels a threat, she would at all costs conceal the fear camouflaging it with a gesture “it is boring here, after all, I was planning to go anyway”. Warthogs apparently have a very short memory. It happens that once they flee, at one point they would stop on the way for a moment reflecting and having forgotten why they are actually running away. Then they would continue. We look at these innocent wading, playing in the Mara river, friendly-looking creatures. Our driver assures “in the evening these animals will come ashore and if you do not run like someone from Kenya or Ethiopia, you are not going to make it”. An angry hippo can reach speeds exceeding 30km/h and it can bite a human in half, yes, in half. The real piece of a beast reaching up to 2 tons. Our afternoon session comes to an end. Together with Signe we still do not have an idea where to spend the night. Nicolas says that a few years ago when he was sleeping just outside the park, two hyenas started attacking his tent at night, he miraculously managed to evacuate to the car. So we abandon the idea in favor of moving a few kilometers away from the Oloololo Gate. The solution comes up by itself. We leave our bikes at the Oloololo Gate and then we all go to the Bush Camp, a base for safari adventures. Prices are a bit inflated, but it’s much better than sleeping among hyenas. After a fancy dinner (about $25 per person), one of the Masai staff shows us a place about 500 meters away from the camp at the top of a slope. I ask him, “if it happens that there are lions or hyenas coming here at night,” and then I hear the reassuring answer “yes, but usually not too often”. Finally we decide to go back and pitch a tent at the camp. Psychologically it helps, but hyenas and so on have no idea where are these invented by humans invisible non-existing fences. Machete in hand adds a bit more peace, just in case, and eventually allows for some sleep. We get up at 5:37 and exactly 17 minutes later our tent is already packed and we are ready for another day of adventures. We drink coffee, still in the dark, but a moment later a pink glow begins to fill the vast plains of Masai Mara. No waiting idly until sunrise. Together with fellow UN workers we set off on the morning session, the second part of our safari. Today hyenas have appeared in the place where yesterday we could see lions finishing the zebra’s entrails. Now it is their turn to take care of the remaining parts. Hyenas have one of the strongest bites in nature, the strength of over 1100 psi (about 80 kg per cm^2). Translating this into practical terms, the cracking of thick bones can be heard from several meters and it sends shivers down your spine. Hyenas, although they live in small flocks, have very individual behavior and not share with prey with others. Last but not least to get their zebra share are vultures, there is still some left for them. The morning light is getting warmer and over several minutes long shadows will begin to contrast with red, orange and at some point already yellow light. We notice some distinctive silhouettes. It is a big family of elephants casually strolling through the deep savannah. Judging by the different sizes of individuals, there must be at least few generations of them. These huge mammals have no natural enemies except for humans. Unfortunately illegal poaching is still a serious problem, hence the frequent armed patrols inside the park, for whom Kenyan government has granted a permission to shoot poachers. We come back to the place where we left our bikes. It turns out that we can’t leave Oloololo Gate so easily. There is a small herd of buffaloes who have just stopped for their lunch break just off the main road out of the park. We are waiting for a car that could assist us for a while. Another herds of animals we have no choice but to pass yourselves very carefully, bearing in mind to always be on the lee side, just as a precarious policeman told us, who probably got a little bit surprised by a view of two Europeans crossing the wilderness on their bicycles. We stop in the first Maasai village shortly after leaving the reserve. Here we enjoy normal food again, chapati pancakes with spinach, in the meantime I fix all the punctures in our spare tubes, perhaps four of them, and we wonder, what will surprise us today. As they say, “A road too easy will take you nowhere”.